It is quite likely you are familiar with the Wat talk by Gary Bernhardt. It is sweeping through the Internet, giving some good laugh to pretty much anyone who watches it. Surely it did to me! After watching the talk for about five times (it hardly gets old), I started to wonder whether it is only those two languages that exhibit similarly confusing behavior… The answer is of course “No”, and that should be glaringly obvious to anyone who knows at least a bit of C++ ;) But beating on that horse would be way too easy, so I’d rather try something more ambitious. 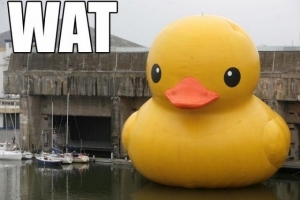 Hence I ventured forth to search for “wat” in Python 2.x. The journey wasn’t short enough to stop at mere addition operator but nevertheless – and despite me being nowhere near Python expert – I managed to find some candidates rather quickly. Behold, then, the Wat of Python!